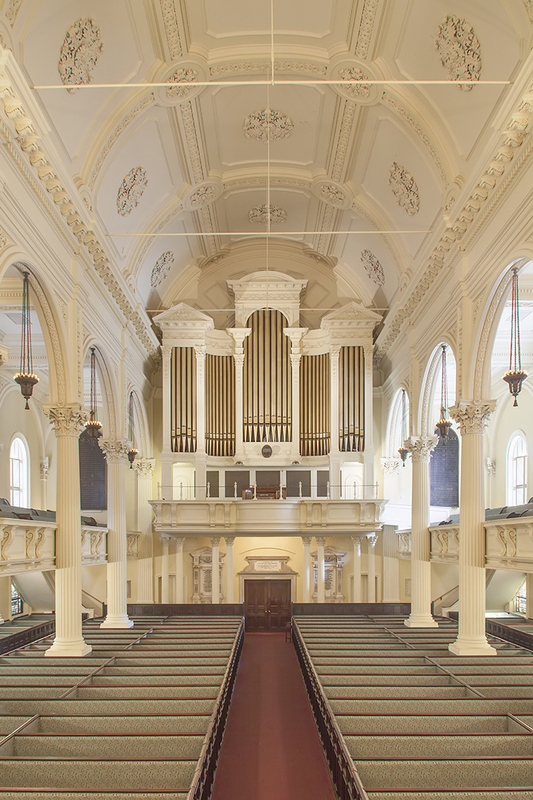 A magnificent new Aeolian-Skinner organ in the Mother Church, the First Church of Christ, Scientist, in Boston, was placed in service for the first time June 1, with Ruth Barrett Phelps, organist of the Mother Church, at the console. This event followed a period of more than a year and a half of construction devoted to the building and installation of the colossal instrument. The instrument includes many features the most outstanding of which is the unprecedented free use of mixtures and other compound stops. The organ contains 235 ranks of pipes, totaling 13,389 pipes and on this basis may be considered to be the largest church organ in the United States. There are 147 independent speaking stops, with twenty-two borrowed stops and three pedal extensions which makes a grand total of 172 speaking stops. Twenty-one stops, totaling about twenty-nine ranks, were retained from the old organ. 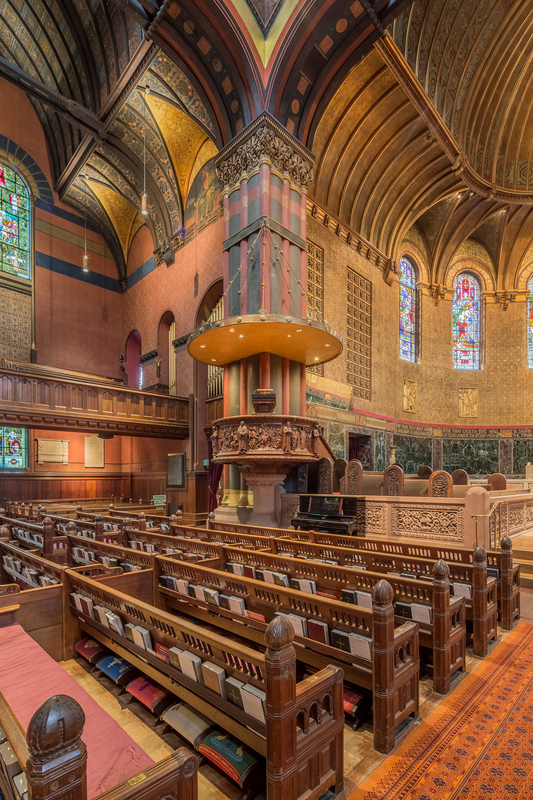 The tonal design of the organ is the work of the Boston organ architect Lawrence I. Phelps. Mr. Phelps, who also supervised the various phases of the work was employed for several years as a technician and voicer and later as a tonal finisher by Aeolian-Skinner. More recently he worked with Walter Holtkamp of Cleveland in the same capacity. For more than two and a half years Mr. Phelps has been employed by the Mother Church, devoting his entire time to directing the reconstruction of its two organs, one in the spacious extension edifice of the Mother Church and the other in the original edifice. The following information concerning the design of the new organ in the extension edifice has been provided by Mr. Phelps. Of the seven manual divisions the swell, choir and solo are enclosed. All of the organ except the solo is installed in one large loft across the front of the auditorium. This loft is approximately seventy-five feet wide, ten feet deep and about sixty feet high. The average height of the main part of the organ is about twenty-five feet, although the facade towers about fifty feet above the floor of the organ loft. The solo is located in an especially prepared chamber, high in the northeast tower of the building, and is heard through a circular opening which pierces the center of the pendentive area to the left of and well above the main organ. The new four-manual console has a total of 197 drawknobs and thirty-six tablets. The choir and positiv divisions play normally on the lowest manual, although the necessary couplers and separation devices are provided so that the two divisions are completely independent of each other and may be played at the same time on different manuals. The same is true of the hauptwerk and great, which normally play on the second manual. The swell and bombarde divisions play from the third and fourth manual respectively. The solo organ is a so-called “floating” division. It is available on any manual and the pedals and is the only division which operates through a key relay. Only the enclosed divisions of the organ have sub and super couplers. The combination pistons are as follows: Hauptwerk and great, 15 pistons; swell, 10 pistons; choir and positiv, 15; pedal, 10; bombarde, 5; solo, 7; general, 10. There are also free combination pistons which are set by means of a recorder board and which do not operate the stopknobs. Normally the free combinations cut off all stops and couplers that may be drawn at the console, but a device has been provided making it possible add any drawn combination to whatever may be set on any free combination piston. The general, pedal and certain other selected pistons from the other manual divisions are duplicated by toe studs. All of the couplers to the pedal are provided with reversible pistons, as are all unison intermanual couplers. A unique feature among the accessories is a crescendo pedal which is completely adjustable, with five separate crescendo setups available through the use of a five-button crescendo selector. All the other usual accessories are available. The organ is designed especially to meet the unique requirements of the music of the Mother Church. These range from the accompanying of a vast audience in the singing of the hymns to the exacting requirements of radio and recording work. This results in the necessity of producing a well-ordered musical performance under radically changing acoustical conditions; also the performance of tbe great variety of music from the organ's rich heritage in a manner which may be considered to be stylistically appropriate. Even so, no attempt has been made to imitate slavishly the work of any period of organ building or of any particular organ builder. The major flue chorus of the organ is naturally that of the great. Basically the chorus consists of the 8-ft. principal, 4ft. prestant and the full mixture, these being topped by the scharf. All of these pipes are equipped with mouths which have a width equivalent to a full two-seventh of the circumference of the pipe. Inasmuch as the use of two-seventh mouthed principals has seldom enjoyed unquestionable success in this country, it was decided to adopt the very ancient and time-honored device known as a keychamber, which has always accompanied the two-seventh mouth in its most successful applications, to the modern windchest. Thus each pipe of the 8-ft. and 4-ft. stop was provided with individual key chambers (perhaps in this application more correctly called expansion chambers). Later it was proved necessary to apply the same principle to several stops in the hauptwerk, where, although the principal chorus is equipped with one-fourth mouths, expansion chambers were found necessary in order to produce a quick response, while retaining a certain ease of speech typical of the best low-pressure work. To make possible the best results from the extensive array of compound stops, G. Donald Harrison, president of the Aeolian-Skinner Company, whose cooperation has been a vital factor contributing to the overwhelming success of this entire project, worked out a system together with the designer of applying large key chambers to the regular Aeolian-Skinner windchest. This makes it possible for all the pipes comprising one note in a compound stop to stand on a common channel, thus receiving their wind from a common source. This also provided a much larger channel for this purpose than is usually available on the modern pitman chest. This system for accommodating compound stops was used in one form or another for all twenty-six of the harmonic corroborating compound stops. Because of this it has been possible to finish these stops in such a way that they evidence a singing quality and a blending ability not always found today. The hauptwerk is a moderately scaled very lightly voiced division standing in the center and at the top of the main structure immediately under the wheel window. Emphasis has been placed on incisive, clear speech and marked contrast in color rather than on power or great variation in strength between the stops. Because of this and its favorable location this division exerts a strong influence even when used against or together with the full great. The sesquialtera is composed of softly-voiced, small-scale principal pipes. The scale of the rankett was especially developed; the sound is rather distantly related to that of the vox humana. The trompette is of a scale developed by Mr. Harrison about two years ago using small English shallots; the tone is free and not the least aggressive. The great is located on the same level as the hauptwerk and to the left. It is a strong full-bodied division containing the strongest flue work of the entire organ. As mentioned above, the principals are equipped with two-seventh mouths. The scaling is large. The pipes are generously winded. The two 16-ft. mutations are fluty and soft. The 32-ft. quintade is a larger scale than the 16-ft. quintadena on the hauptwerk, but it fills a similar office for the graver great. It is a thoroughly usable stop adding gravity without thickness. The two rehabilitated open flutes are typical of the best examples of their species. The scharf is the crowning glory not only of the great but of the whole organ. The cornet is really a complete secondary principal chorus about the same scale as the principals but with one-fourth mouths. The enclosure for the swell is centrally located in the organ loft. It occupies a floor space approximately twenty feet by six feet eight inches and rises against the rear wall to a height of about twenty-two feet. Actually the hauptwerk windchests form the top of the swell-box. The full swell is about equal in strength to the great, though of course there is a sharp contrast in color. The sesquialtera is voiced equal to the diapason in strength as are the plein jeu and cymbale. The three-rank fourniture is a small, moderately voiced mixture. The chorus reeds are of the French type, which have become virtually a Harrison trademark, although several alterations in scaling have been made to adapt them to the acoustics of the auditorium. The choir is all on one level and stands immediately to the right of the swell. It is a gentle division whose chief purpose is to assist the softer work in the swell in accompanying the soloist. The Mother Church uses only a soloist. As it was necessary to “double deck” the swell, it is fairly certain that with changes in temperature the pitch in the upper and lower swell might not always be together. To reduce the significance of this fact all the chorus work in the swell, both flues and reeds, was placed on the upper level while all of the softer work was grouped on the lower level. This means that the accompanimental stops of the swell will always be in tune with the choir and that the stops that make up the swell choruses will always be in tune with each other. Returning to the choir, the sesquialtera consists of two large-scale soft open flutes. The carillon is composed of a large-scale rohrflöte and two nachthorns. The 16-ft. bassoon is half-length. The tuba is the genuine article and is enclosed. The positiv stands on two levels directly in front of the swell. The specially-constructed lower windchest projects in front of the small center limestone arch approximately two feet and a beautifully carved mahogany case has been provided which covers the front of the chest. This casework is not merely decorative, as it provides a home for the lower pipes of the 8-ft. viola da gamba and 4-ft. prinzipal, these being of polished tin. So carefully were these details worked out that many of the smaller front pipes which appear to be standing on the mahogany case are actually standing on the main windchest. The whole division is voiced lightly. The mouths are cut very low and nicking is kept to a minimum. The gedeckt is the only new manual wood stop made for the organ. The cornet is wide scale and lightly winded. It is placed together with the three reeds on the upper chest. This upper chest protrudes beyond the small limestone arch only a few inches and the first rank of the cornet, which is of polished tin, is visible in the background above the main positiv case. The three reeds have been developed especially for this organ and are refined examples of their European counterparts. The bombarde organ is placed on the same level as the great and the hauptwerk and this completes an array of unenclosed pipework across the top of the structure of the organ. The main portion of this division stands in the right end of the loft over the choir, but the two-rank principal is part of the facade. It has been arranged to frame the wheel window as it stands on the cornice of the limestone arch with the first rank, of polished tin in front. The cornet is identical with the one in the positiv except that it is stronger in every way. The two mixtures and the harmonics are voiced to complement the reeds, although together with the principal they are very useful in accompanying the enormous congregation. This is the reason that the bombarde was placed at the opposite end of the chamber from the great. The reeds are harmonic, with French shallots, and are voiced normally for the wind pressure. The solo is in a newly-constructed chamber which replaced the one formerly occupied by the old echo organ. Several of the echo stops were retained. The old great principal chorus was revoiced and placed in this division with the two old solo flutes. The celestes, however are all new. The dolcans are ten semitones larger at the top than at the mouth. The division is actually an amazingly useful echo-solo-string-antiphonal organ. The pedal organ was planned with the idea of making the use of pedal couplers unnecessary. Certain of the softest manual stops were selected for borrowing to the pedal. This gives a considerable choice of soft pedal tone, ranging from 32-ft. to 4-ft. without the customary disadvantages brought about by the use of manual to pedal couplers and, as these stops are seldom used in manual combinations until the tonal level has passed beyond the point where they would be of any use in the pedal, there is no real loss of independence. The twenty-nine independent pedal stops are voiced to develop the individual character of the pedal, so that by contrast in color as well as in pitch the pedal line is always clearly distinguishable from what is being played on the manuals. All of the pipes of the violon and grossquinte and twelve pipes of the 16-ft. principal are in the facade. The pipes of all stops 8-ft. and smaller are placed on five chests which partly form the top of the-choir box and this close grouping of the pedal upper work has made a considerable contribution toward the development of the individuality of the pedal. None of the pedal reeds are overly assertive, but when properly drawn fit neatly into the pedal ensemble. The design of the imposing new facade is the result of many weeks of close collaboration between the organ architect and William G. Perry of the Boston architectural firm of Perry, Shaw & Hepburn, Kehoe and Dean, which was the architectural consultant for an extensive program of renovation in which the Mother Church has been engaged. Certain limestone and plaster features which were part of the old front were retained and incorporated into the new design. Most of the old front pipes also were retained and were redecorated. About 300 new pipes were added to the display and there are now 377 polished tin and gold-leafed pipes visible across the front of the organ. The majority of these are speaking pipes. In 1875, the “New” Old South Church was equipped with a three-manual (three keyboards) Hutchings organ, sited in the gallery. This was replaced in 1915 with Ernest M. Skinner Organ Company’s Op. 231, a four-manual with a 32-foot metal Gamba and wooden Bombarde, a Physharmonica, and the full complement of Skinner specialty voices. Like the Hutchings, the Skinner was also installed in the gallery. For many years the eminent Dr. Carl McKinley presided over this instrument. In the early 1980s, under the leadership of then-organist David Garth Worth, an effort was begun to return the Skinner sound to Old South Church. Skinner Op. 308, built in 1921 for the Municipal Auditorium of Saint Paul, Minnesota, had suffered the fate of most municipal organs of its day. Although these organs opened to great fanfare, the advent of radio and sound pictures caused such instruments to be used less and less. Old South learned of the instrument’s availability mere weeks before the auditorium was to be razed and decided to act. A consortium was quickly formed to remove and store the instrument. The crew consisted of the A. Thompson-Allen Co., Curators of Organs at Yale University; Foley-Baker Inc. from Tolland, Connecticut; and Nelson Barden Associates of Boston. Once the heroic removal effort was completed, attention turned to how the organ could be installed in Boston. Some consideration was given to retaining the gallery arrangement, but Old South was ready to have music join with clergy in the chancel area. Such a job being beyond the capabilities of the New England restorers, other vendors were explored, and ultimately Casavant Frères, Ltée. of St. Hyacinth, Québec was chosen, in a two-contract arrangement with that firm’s regional representatives, Henry Hokans and Richard Knapp. 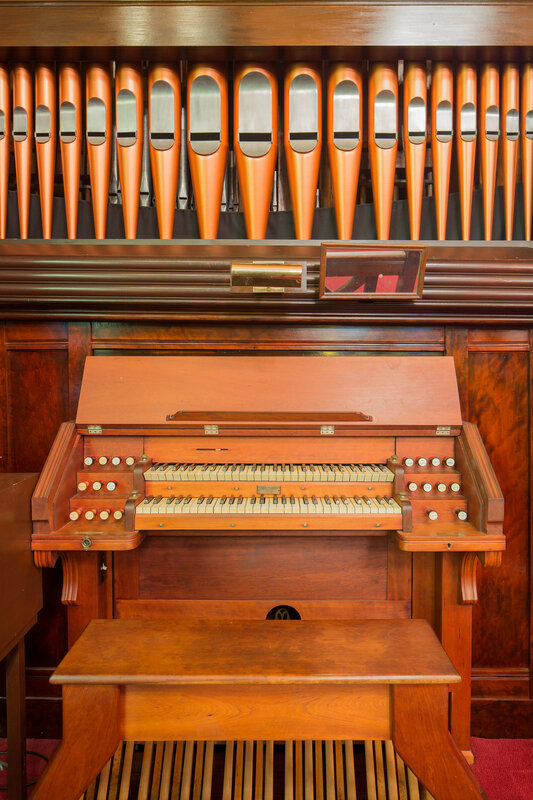 The Reuter organ was sold back to Reuter in the early 1980s; Reuter took it back to Kansas and repackaged it for St. John's Lutheran Church, Winter Park, Florida. Named in memory of two influential leaders — Charles B. Fisk, who influenced the trajectory of American organ building in the 20th century, and the Rev. Peter J. Gomes, who adeptly communicated through word and speech the presence of God’s love in art and music — this Fisk, Op. 139 stands as a soaring testament to music’s immeasurable power in corporate worship, its place in a modern and dynamic university, and its impact on the lives of countless persons who, in the coming decades, will find inspiration and seek knowledge in its smooth voice, malleable tone, and delicate craftsmanship. 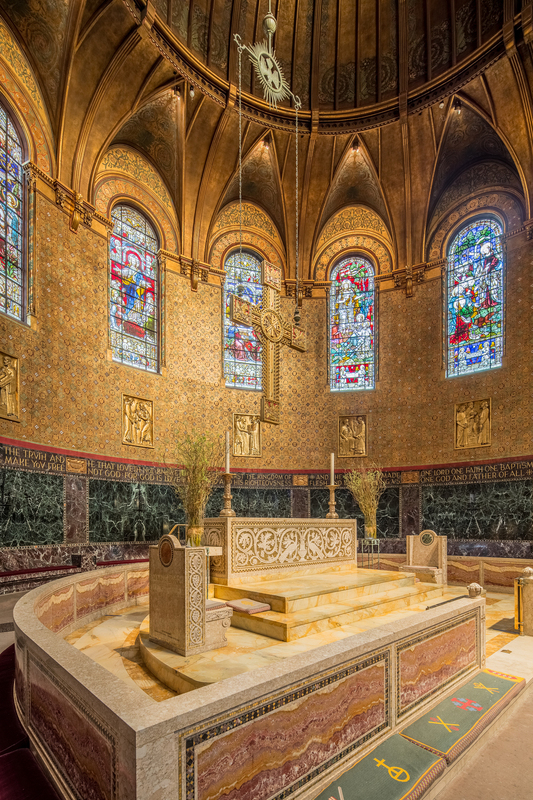 The installation of Opus 139 marked the completion of a multi-year period of restoration and renewal in The Memorial Church, a project that is a legacy of the late leader, the Reverend Professor Peter J. Gomes, Plummer Professor of Christian Morals and Pusey Minister in the Memorial Church at Harvard University. He was a man whose genius was to not only embrace the past, as he did so vibrantly, but to envision a definable and glorious future for his beloved institution, ensuring both its viability and vitality. 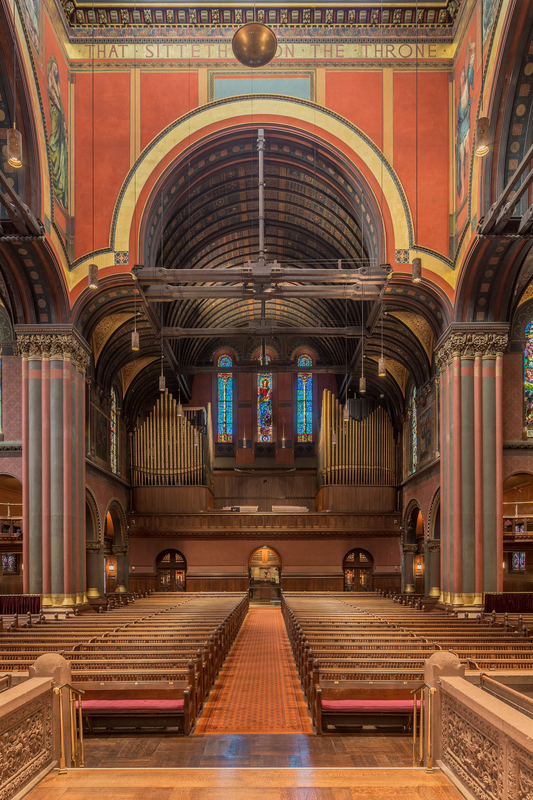 The Fisk organ is ideally suited for its space — not only architecturally, but tonally. Its 3,110 uniquely crafted pipes comprising 44 individual voices sing vibrantly into the room for which it was designed. Its placement in the gallery near the ceiling helps guide its sound efficiently into the room, allowing for an enlivened sonic experience and an eminently improved capacity for supporting congregational singing in the Church. Three divisions of the organ — the Great, Positive, and Pedal — live comfortably inside the main case of the organ, while the substantial Swell division and the largest of the pedal pipes (which are as wide and long as an oak tree’s trunk) are housed in new construction within the attic of the church, speaking through a tone chute hidden by the upper portion of the casework. The Positive division in the main case is behind the central façade and above the organist’s head, allowing direct speech into the room; many of the organ’s “melody” stops are in this division, which is ideally suited to interact with the magnifying qualities of the barrel vaulted ceiling. The Great and Pedal divisions are spread low and wide to the sides of the main case, minimizing their interaction with the vaulted ceiling, thus ensuring that these fundamental and substantial divisions do not tire the listener’s ear. The majority of the pipe-work is made of hand-cast sheets of lead and tin alloys. (The quality of a pipe’s sound is largely impacted by the specific metal alloy utilized.) The remaining pipe-work is constructed of wood, which in many cases gives the tone a “flute-like” quality. All of the pipe-work and its supporting mechanisms are connected to the console via an intricate system of “trackers,” allowing the organist to control the organ’s breathing and speech by manipulating the engagement of wind and pipe. (For instance, a fast key attack at the console will create a different quality of pipe speech than a slow one.) While the fundamental design of a “tracker-” (or “mechanical-”) action organ hasn’t changed in hundreds of years, our organ trackers are made of modern carbon fiber material, which is stronger than wood or metal and lighter for the organist’s touch. In addition, Opus 139 features a Kowalyshyn Servopneumatic Lever, which provides a power-assist to the Great key action and couplers, allowing the organist to manage and control large portions of the organ with relative physical ease while maintaining a fine sense of connection to the instrument. Finally, our organ lives in its own climate; a dedicated HVAC system provides air to the organ that is then cycled back by way of a circular system. The resulting environmental constancy provides the instrument with tuning and mechanical stability in a church that, on the whole, is not climate-controlled. 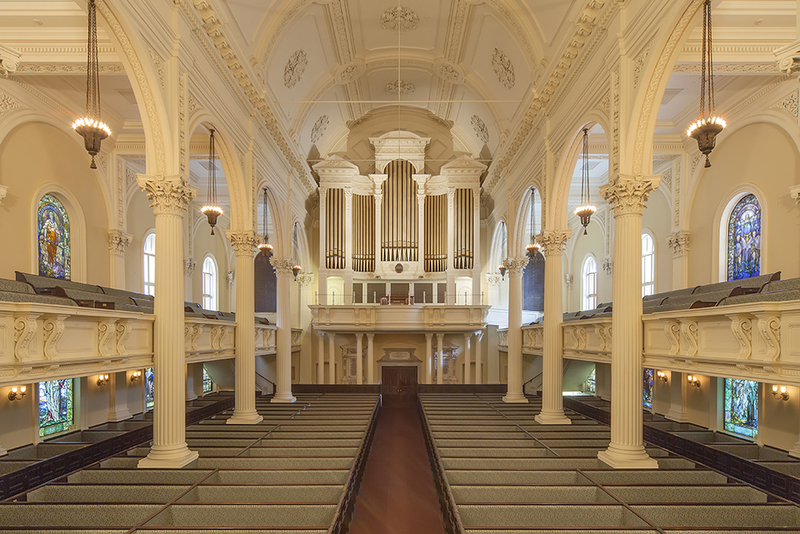 When initial discussions about the possibility of a new organ in Memorial Church began in 2005, they presented C. B. Fisk, Inc. with a complex set of challenges and opportunities. Charles Fisk, the founder of our company, was a Cambridge native and a Harvard alumnus. In 1967, his then six-year-old firm built a large four-manual organ in the Church’s Appleton Chapel, in front of the grand Palladian window. It was not the location that he would have preferred, and caring for this instrument over the intervening years had given us, his followers, an appreciation for the reasoning behind his preference and an intimacy with the splendors and foibles of the acoustical environment into which it spoke. The decision to build a new organ in the gallery, to move the choir there for Sunday services, and to install a separate instrument in the original chambers of Appleton Chapel frees both instruments from compromise. The tonal design of Opus 139 is an eclectic choice of historically based voices that authentically reflect the best examples of French, German, and English organ sound from the last four centuries. With the Swell and the Positive divisions under expression, a plethora of colors at eight-foot pitch — including the powerful Tuba mirabilis — is available at all dynamic levels. In the Fisk tradition, the visual design of the new organ was carefully created in a precise scale model of the building to ensure harmony with the Georgian Revival interior. 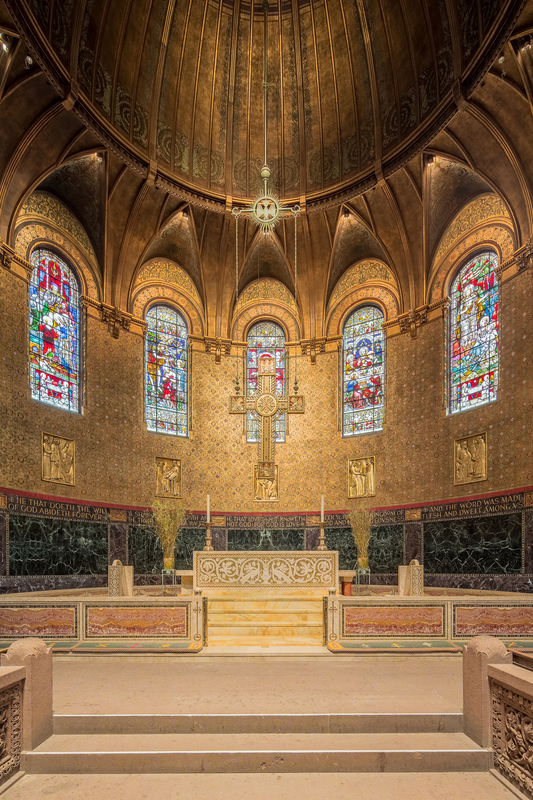 The dark oak case, ornate carvings, and gold-leafed front pipes were all concepts developed in consultation with the Reverend Gomes and the musicians of Memorial Church. The position of the organ in the gallery, the arrangement of the divisions within the organ, and the decisions made during the nine-month voicing process all reflect our long-term study of the acoustical properties of the room and the roles the organ will play in the life of the church, first and foremost as choral accompaniment and in support of congregational singing, but also in solo recital and as a teaching instrument. The men and women of C. B. Fisk, Inc. spent more than 40,000 hours to create Opus 139 as a tribute to Charles Fisk and the Reverend Gomes, whose friendship and guidance we valued so highly. Charles Fisk always dreamed of building a major pipe organ for his alma mater. As a young physics major at Harvard College, he could often be found tinkering with organ pipes in his dorm room, and it was this passion for the pipe organ and its music that ultimately compelled him to abandon a blossoming career in physics to become an organ builder. 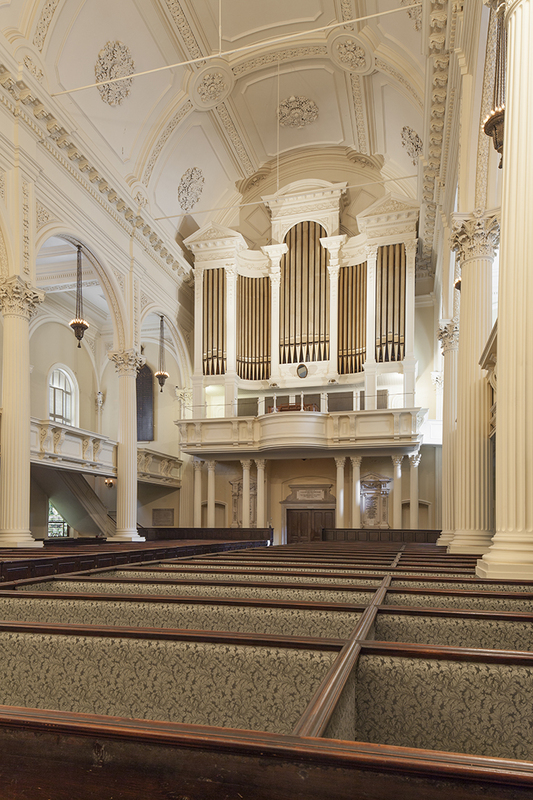 With the installation of Opus 46 in Memorial Church in 1967, his dream of building an organ for Harvard was realized. Charlie loved to keep ideas flowing and to “stir the pot,” as he would say. Opus 46 was a daring instrument that not only represented his then most notable to date, but it also influenced American perceptions on how organs could and should be built for decades to come. Opus 139 continues his relationship with Harvard. Wellesley College first signed a contract in 1972 for a two-manual organ based on antique Dutch instruments from the early 17th century. The idea of an organ of ‘uncompromising authenticity’ underwent considerable evolution in the decade preceding its construction. From the beginning, it was intended that this specialized instrument would allow serious students of the organ to experience authentic antique European sounds. The design of the instrument would require extensive research into materials, construction methods, and voicing techniques involving hands-on experience with historic instruments. College officials were aware that this unusual instrument, by offering ‘ear-opening revelations,’ would be an important contribution to the international organ scene and would draw acclaimed musicians and scholars from around the world. Research trips taken in 1974 and 1977, organized with the help of Harald Vogel, directed the focus of the project onto the instruments of Gottfried Fritzsche, represented in the surviving work of his son-in-law, Friedrich Stellwagen. Of particular interest was Stellwagen’s three-manual organ at the Jakobikirche in Lübeck, Germany. Measurements and observations made in the Jakobikirche and in the Compenius organ at Friedricksburg Castle in Denmark provided the raw data used to construct authentic key actions, wind system, windchests, and pipework. For insight into18th century construction methods Charles Fisk and his colleagues regularly consulted Dom Bédos de Celles' 1775 treatise L'art du facteur d'orgues. The vision for this instrument was first articulated by Owen Jander, noted scholar and longtime Professor of Music at Wellesley. He frequently visited the workshop during the construction and was a constant source of encouragement, not only to Charles Fisk, but also to all the shop members. After the dedication he worked tirelessly to raise funds for the completion of the Pedal and Brustpedalia divisions, as well as for the hand-carved gilded pipe shades by sculptor Morgan Faulds Pike. The organ’s casework is fumed white oak, and the façade pipes hammered burnished spotted metal, half lead and half tin. The wind pressure is 3 1/4" water column, and the temperament is 1/4 comma meantone. The organ is equipped with two winding systems, a human-powered double wedge bellows system, and an electric blower system using one of the wedge bellows. In 1995, under the direction of organ consultant William Porter and Minister of Music Mark Meyer, discussions began for a new mechanical action organ to replace the previous electric action built by Wicks. After a nationwide search, Richards, Fowkes & Co. of Ooltewah, Tennesee was selected. The organ was completed in 2000 as the company’s Opus 10, and has since gained a reputation as one of the finest Baroque organs in New England and one of the best instruments in The Lutheran Church—Missouri Synod. The North German case of white oak blends well with the simple linear feel of the church interior. The ornate case, designed in the North German style and constructed of white oak, contrasts with the linear architecture of the nave, not unlike an antique work of art in a modern museum. The organ is voiced with a gentle, vocal quality that is nevertheless strong enough to accompany congregational singing, and it renders the organ repertoire of the historic Lutheran tradition with the utmost authenticity. There are seven independent reed stops over the two manuals and pedal, including three (with a short length 16′ Dulcian) in the Rückpositiv. The manual coupler connects the Werk to the Rückpositiv in the Dutch tradition, rather than the more normal Rückpositiv to Werk. This is particulary useful in leading hymn singing: the accompaniment can be played on the Werk, and its stops combined with those of the Rückpositiv play the chorale tune. E. Power Biggs was without a doubt one of the most famous concert organists of his day; his recordings are still widely available. Many of those recordings were made right here, on this very organ. Born in England in 1906, Biggs emigrated to the United States in 1930, and settled in Cambridge in 1932. By that time he had already begun to build a name for himself as a touring concert organist. In 1937, Biggs persuaded Charles Kuhn, then Curator of the Busch-Reisinger Museum, to let the Aeolian-Skinner Organ Company of Boston install their experimental Baroque-style organ, designed by the famous G. Donald Harrison (another Englishman) in the Romanesque Hall, which many people had already realised would make an ideal location for a concert organ. This instrument caused quite a stir in the musical world; Biggs played the complete organ works of Bach on it in 1937/38. In 1940 he began a famous series of Sunday morning coast-to-coast broadcasts on CBS radio from here that for many people of that generation was their introduction to organ music. In 1954 Biggs made a tour of Europe, playing on many historic organs. This confirmed his growing dissatisfaction with the G. Donald Harrison instrument, and he conceived the notion of commissioning a new instrument for the hall from Flentrop, a Dutch builder whose instruments were known for their inspired re-interpretation of the Baroque models. In 1957 the instrument arrived; in 1958 CBS canceled the weekly broadcasts! Biggs, undaunted, immediately began an ambitious series of recordings for CBS records, which ultimately included three volumes of Bach favourites (including the D minor Toccata and Fugue) and much other music both solo and with other instruments. For many organists these records were their introduction to a new kind of playing, informed by historical scholarship, that came as a revelation. Biggs continued to play recitals and record on this instrument up to his death in 1977. The 1875 Hook & Hastings organ at Holy Cross Cathedral is the largest extant organ built by the firm.